Photo taken with crapcam. It turns out that 976 pages is nearly 11cm (4.5 in) high. I don’t have a scale, so I can’t weigh it. It took about an hour to print. Why all the detail? So I can delay actually reading the thing, of course. As I write this, snow is falling, so I might not be able to go out to the splendid lunch I have planned with two fellow writers. Which of course would mean I’d have no choice about beginning to read. Wow, that's a book that'll build up some muscle and strengthen bones. Oh, but think of how much better it will be after an edit or two. Editing makes me excited, even if starting it feels like a chore. tranceptor, editing is where the metamorphosis occurs: typing –> novel. I can't wait to work out with that novel either! 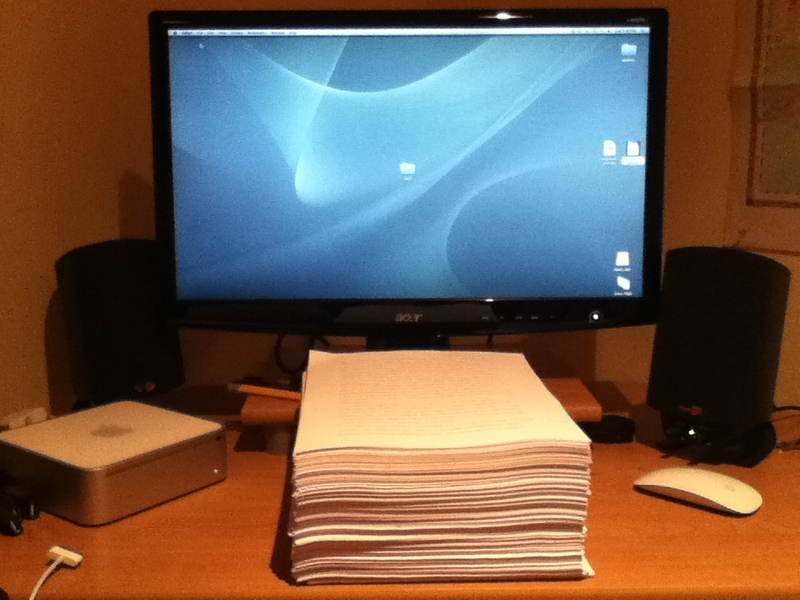 That is one daunting pile of paper or a thrilling adventure. For a patient reader…a tempting morsel. Good luck and have fun with your baby. Maybe you should give yourself a couple more days to rest up for this t next phase? At least the snow will not prevent you from your luncheon plans. Enjoy. jennifer, yep, more resting (and eating, and drinking). I'll be closely following your posts about the revision process. You will be posting about that, won't you? Happy crafting N, it's like magic isn't it, the way Hild will form in your hands. Jude, yes, the rewrite is where I really get to know her. O.o That thing is huge. Sly, yes, definitely in your lifetime! If you're using 20 lb. paper, that means that a 500-sheet ream of 17″ x 22″ paper weighs 20 lbs. You've used slightly less than half a ream, so your baby should weigh slightly less than 10 lbs. Nicola — you used 976 sheets of 8.5″ X 11″. There are 2000 sheets of 8.5″ X 11″ paper in a ream of 17″ X 22″ paper. 20 lbs/ream X 1 ream/2000 pages X 976 pages = 9.76 lbs = 9 lbs 12.16 oz.